Gloria Doyle is a Gospel Music/Word Minister, SongWriter, Cosmetologist and A Mother. She has two albums to her credit with six singles. She once had a controversial squabble with musician turned pastor, Felix Liberty. 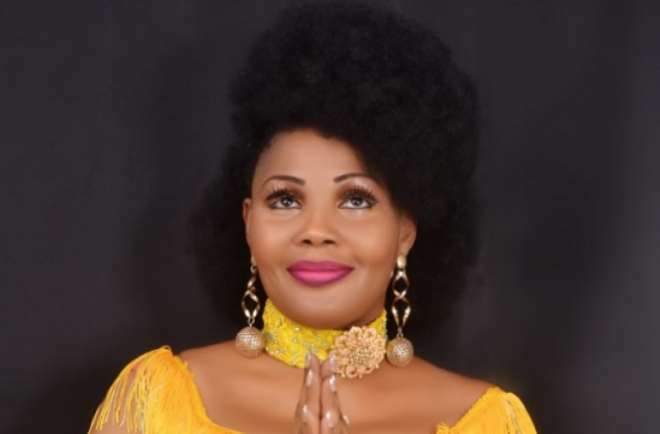 The YeyeGospel (Mother of Gospel) tells in this recent Interview with New Telegraph that She was part of the Rebranding Process of Gospel Music. Why did you choose to go into gospel music? Since 2007 till date, people have always reckoned with me as a gospel artiste. I did not chose to go into gospel music; it is my calling and I think I am operating within my calling to proclaim the word of God through music and that makes me a gospel artist and that is how it has been and that is how it’s supposed to be. How many albums do you have to your credits? I’ve about two albums, and six singles including the Newly Released Single Titled: "PRAY". I just came back to music fully again because I had a break then because of my kids; they were growing up and needed to be monitored closely so they don’t mix up with bad peer group and as a single parent, I needed to take care of them and now they are all graduates working in the United States of America. At what point in life did you discover this calling? Well, I’ve always loved the word while growing up. I can recall in those days when my mother will send me on an errand and I will hide to read my bible. I have always had this love for the word of God and I had the opportunity to go to Sunday service to minister the word of God at my own level of understanding of what the word of God is all about. Also, I had the opportunity of singing about the love of God upon my life when I was in secondary school. But I went into it professionally in 2005. While growing up are there people you held on to as career models? Yes, I think the likes of Chris Okotie, Felix Liberty and those people that were really popular then when I was growing up in the 80s and I think I really looked up to them. But they were not gospel singers? Yes, but along the line both are successful pastors today. Is it true that you and Felix Liberty allegedly started a church? No. We did not allegedly start a church. He had a place in Lagos he was running as a ministry and could not run it successfully; he relocated to Benin and gave the place to me. When he came back six months later, he saw that the place was booming; saw the kind of crowd that he did not see before he left for Benin and it was not by my power but by calling and that attracted some sort of jealousy that led to misunderstanding between us. But at the end of the day, I had to step down. Although he apologized, I had to let go because if we are working for God we are not working because we want to fill our bellies. It got to a stage where he said I should be paying for the place. I said no because I was using the platform in touching the lives of people and I was not out to make money but right now, he is still a godfather to me and I respect him. You are a cosmetologist, pastor, gospel singer and event centre manager, how do you combine all? I give God the glory for the ability and the grace God has given me to harness them. Music gives me enough attention; it’s not as if my calling is a bit easy for me now. I am a fully trained cosmetologist; I make people look good. As a single mother that is the business I put my children through to know. But now I have decided to go back to music and the word of God. It is all about drawing a battle line and to give attention to them. Among all these talents, which one pays the bill? Cosmetics do a lot of funding for me. You see one thing about a career is a long term investment that will grow; in the long run, you will start getting the returns. When you say you are born again in an entertainment industry, do they work together? In a show business, once you are attractive , if you are a hip pop artiste or any of the secular artiste, one thing that usually befall us, especially those of us that are ladies is sexual harassment . People will want to take advantage of you, but if you know what you are doing, you should be able to know how to draw the line. Yes as a gospel artiste a lot of people are saying we are going to do this for you, but I would like to have a relationship with you. I think that is one of the reasons I am a bit slow, I will tell them to just forget about it and I will say to myself that one day I know God is going to take the glory and as a gospel singer if you give in to such, you don’t have any message that you would want to pass across. You are a pretty woman with heavy make-up and irresistible. How do you still find time for God? When it comes to gospel music, I was one of those that rebranded gospel music. You can still look good and not explicit; you can still be a carrier of anointing of God. You can look good and still be an oracle of God which I stand in this office. I was one of those people that say that you can still be a gospel musician and still look good in the presentations of your lyrics. The Bible says, ‘We are fearfully and wonderfully made’. If you have read the book of Esther in the Bible before she was to be presented to the King, she had to go through one full year of beauty routine before she was presented to the king; you must be able to take care of yourself. The way you look, that is how you will be addressed. Why do you choose to be a single parent? I don’t think any woman would wish to be a single parent. I got into marriage at a very tender age but it was unfortunate that it was abusive. I did not want anything that will affect my children psychologically or lose my life to it because during that period I saw three women that lost their lives. They were beaten by their husbands and they went into coma and passed on from there and I did not want my case to be the same because I had to make sure that I stay alive for my children. I’m happy that I took that decision by walking out from a very abusive marriage. I am alive today and I give God the glory. Did your growing up shape what you are today? Yes, because I come from a polygamous family where my father married five wives and over ten concubines. My mother is the second wife that was legally married to my father and had seven of us and I am the first. In a polygamous home, the upbringing is very competitive. And it becomes a spiritual and financial battle. It shaped me to be a fighter and to believe in myself. People see you as a controversial person, are you really one? Yes, I’m a very controversial person. Has being controversial helped you? Yes it has helped me to always stand on my ground because people want you to be what they want you to be and I have always stood my ground as a controversial person. I am very confident of myself, some will say, ‘she is a gospel artiste look at the way she dresses’ and I will say let give ourselves a test. I will say let talk about Christ and see what happens; I’m very confident of myself. Would you like to fall in love again if you come across another man? Well, I have been asked these questions severally. I always tell them that for now I still have this phobia for marriage, but blessed is the man that will be given unto you and you overcome.